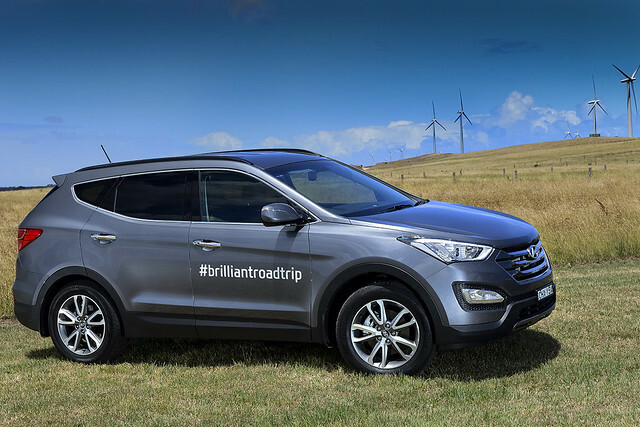 Drive Brilliant - Day 2. Crossing Borders. 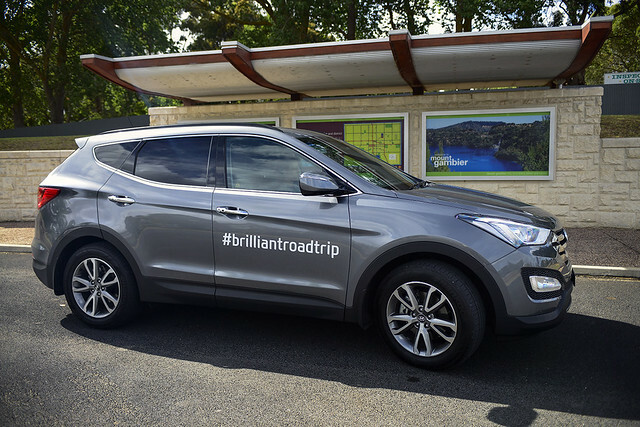 Drive Brilliant – Day 2. Crossing Borders. 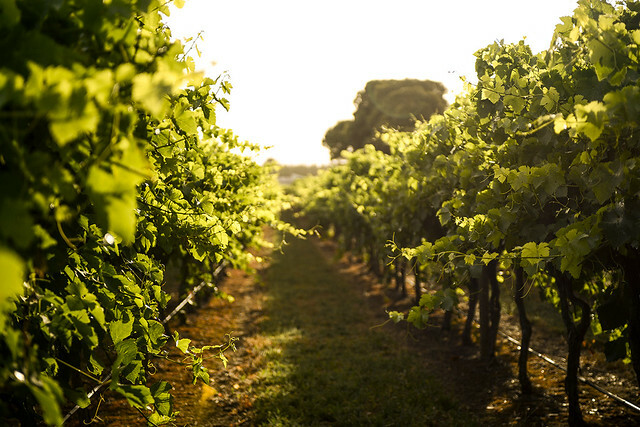 Waking up in the Beautiful Coonawarra Wine Region to take photos of the rising sun through the vineyards was tough. The day was only going to get tougher with some forests, caves, Mt Gambier’s Blue Lake and a helicopter flight along the Great Ocean Road. Yep, it’s a hard life sometimes, but someone has to step up to the plate and take one for the team. Yes, I’m selfless! You can thank me later! 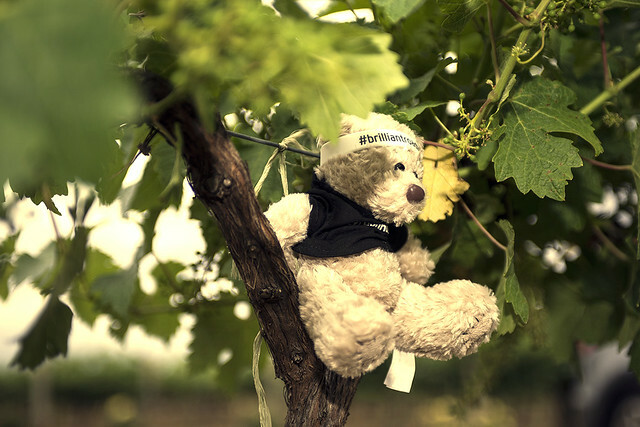 Little Bear had an even harder start to the day, soaking up some rays while I was off shooting. Poor Little Bear! Liv and I knew we had a massive day ahead and successfully got up early to make the most of it all. 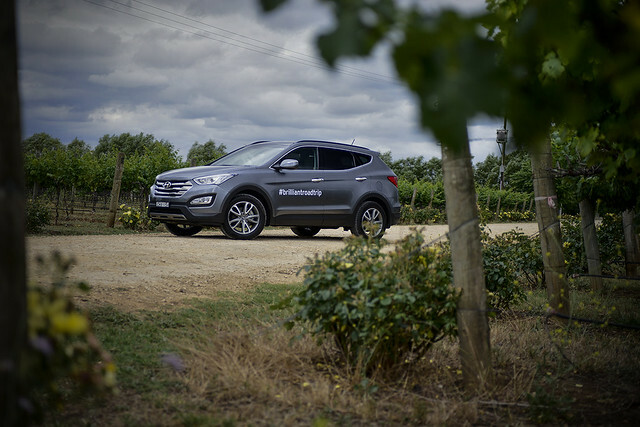 We hit the road early in the morning and began our second day in the New Santa Fe. We didn’t see another car travelling in either direction for the best part of half an hour. A weird experience for city dwellers I assure you. It felt like we were the only people left on the entire planet! We set the Satnav for Mr Gambier and headed south. 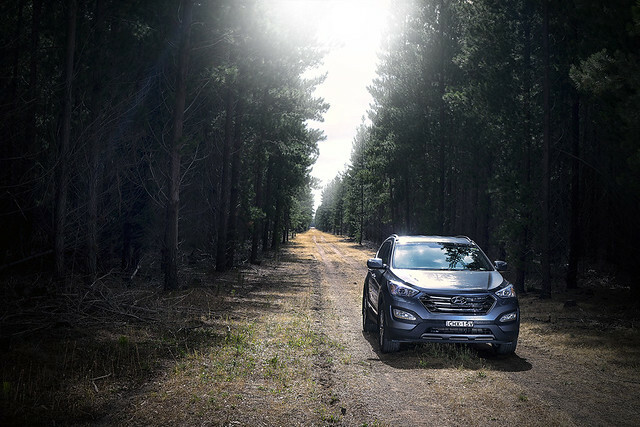 Time was on our side due to the early start so when we came across the Pembula State Forest we decided to make the most of the Santa Fe’s 4×4 ability and detour through some forest trails. 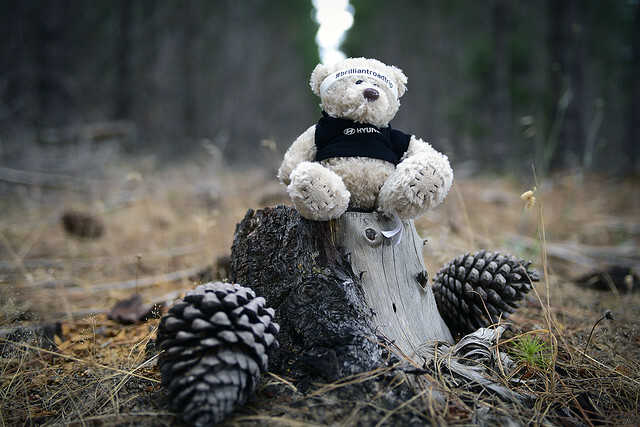 Little Bear felt right among the giant Pine trees and ran off to get back to nature. Liv and took a couple of photos, both of the car and a few selfies for the photo album at home. 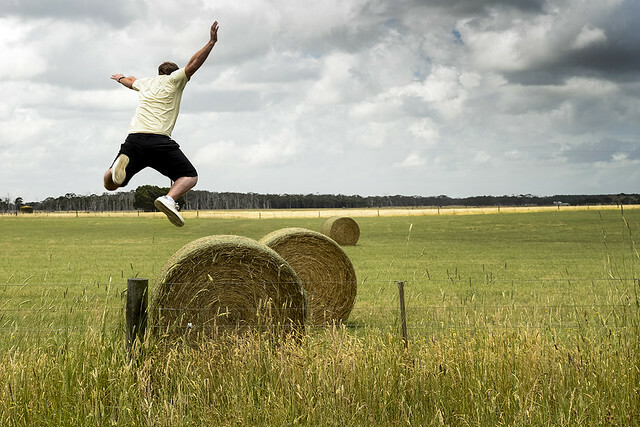 As we stopped to take a few shots and were greeted by a giant hare and a bounding kangaroo, it was pretty early though and I’m not a morning person, so I missed the opportunity to snap them for you guys. 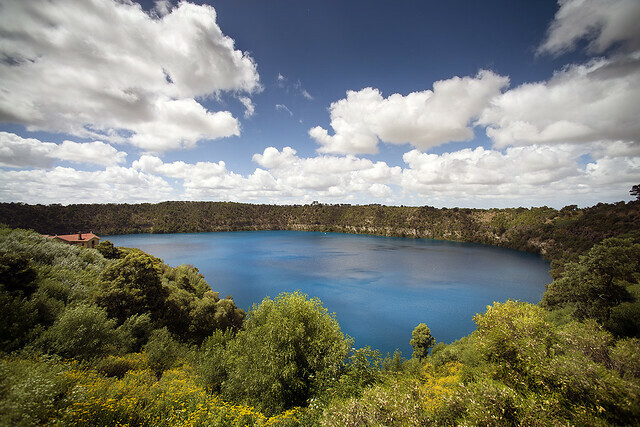 We re-joined the tarmac and continued down to Mt Gambier, a city built around an extinct volcano and the famous Blue Lake. If you’re ever out this way you MUST stop by and check it out! The water is bluer than the sky and it’s surrounded by vibrant green trees and yellow flower! It looks more like a painting and less like reality. It’s absolutely beautiful! 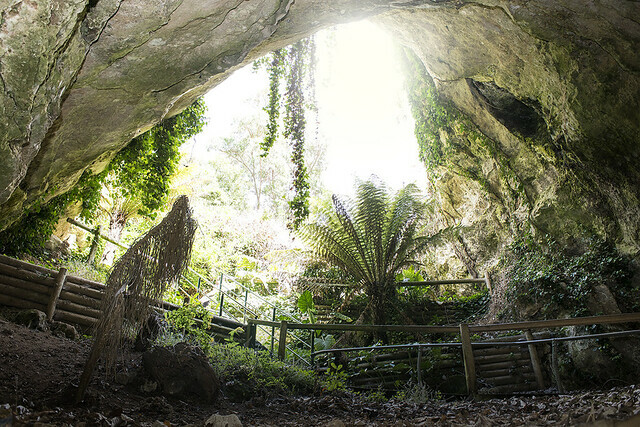 First stop in Mt Gambier was a subterranean stop. Under the city is a bunch of connected caverns, caves and lakes. 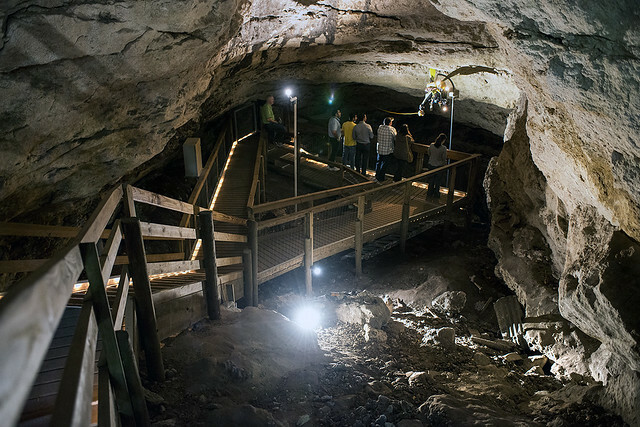 We found the Engelbrecht Caves and joined a guided tour that took us below the cities roads and homes. The water in the caverns we saw was on its way to the Blue Lake, a journey that will take somewhere between 500 to 2000 years to make the 10 km journey. It was all very impressive! It’s hard to believe that the locals used these caves as a place to dump rubbish from the 1800’s all the way up until the 1970’s! Local volunteers spent the next 7 years cleaning the site and preparing it to be open to the public. Thanks guys! We travelled down to about 30 metres below the surface and visited two seperate caves. And got a bit of insight into the series of underwater lakes and caverns that are accessable from the caves. What’s that in the corner there? A diving dummy of course! Let’s call him Dave. 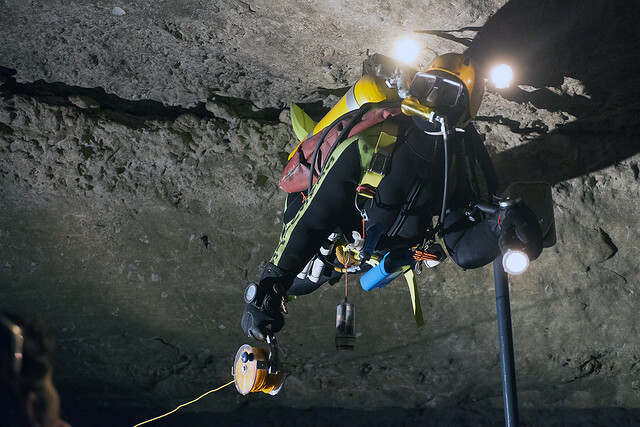 Divers in the caves need to take 2 of everything, including 2 watches, 2 air tanks, 2 breathers. You wouldn’t get many second chances down in the tubes if something goes wrong. And why wouldn’t he be? The Blue Lake was the highlight of this leg of the trip, seriously the water is bluer than the sky on the bluest of blue days! We found out the Blue colour comes from the water being filtered through the limestone caverns below and also that it changes colour for a week or so every November. If you’re ever in the neighborhood to stop by! It’s Breathtaking! Yes, that’s the actual colour as you see it with your eyes. It’s no trick photography! Next to the Blue Lake is a lookout platform, Rook Tower, it’s not very tall but it’s made from old school flagstones. 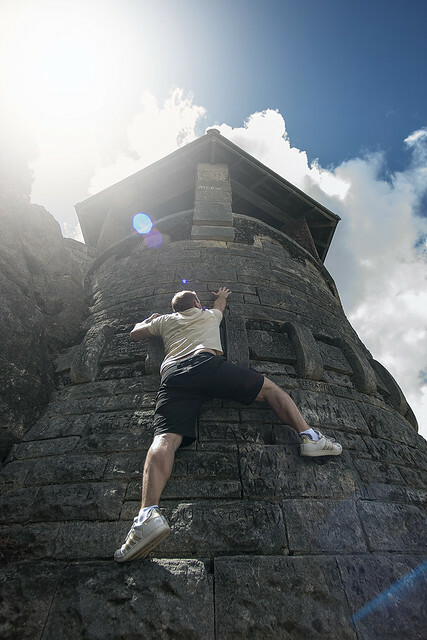 I thought I’d get my James Bond on and give it a climb. Liv had a go too. You can’t take kids anywhere these days! 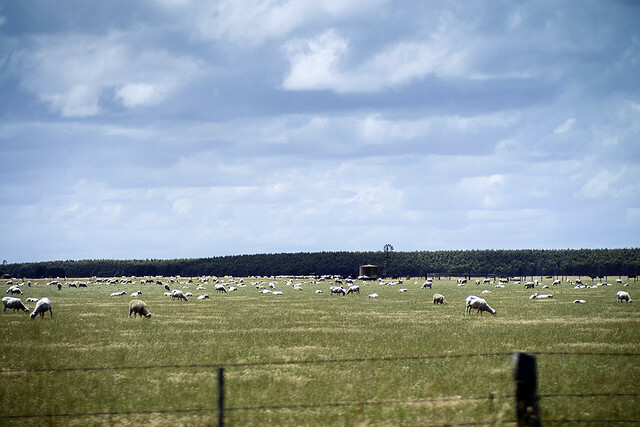 After a quick bite to eat in Mt Gambier we set off to cross the border and an hour later we said ‘see ya S.A and Hellllllo Vic!’ The scenery along the way mostly consisted of farm land and commercial forests. I’ve never seen so many rolls of hay. After a heat discussion about if they’d be comfortable or not Liv and I decided to find out. We pulled over and we’re going to try and jump on a bail each, but Liv being the more sensible of us decided that the electric fence was a good enough reason to not find out. I wasn’t so easy to deter though. :p I wasn’t keen on getting zapped either though. I jumped on the pole with one hand, one foot and some Jedi skills, then leapt for all that I was worth over the fence! 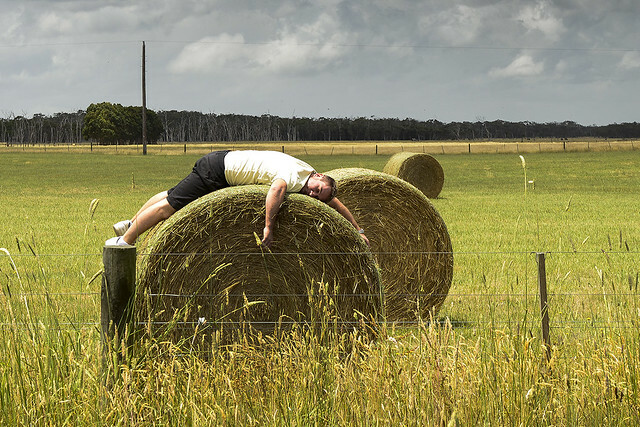 I can confirm that the hay bails are quite comfy! If not for the deadlines we had I probably could caught an hour or sleep up here and not felt to bad about it. 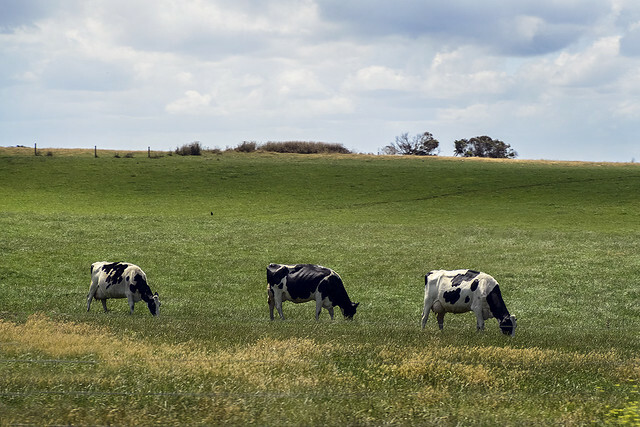 fat cows munching on the green, lush grass. 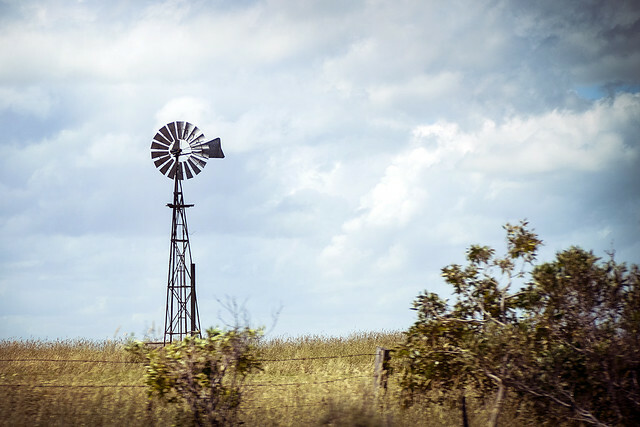 or my favorite of all, the good old tin windmill! 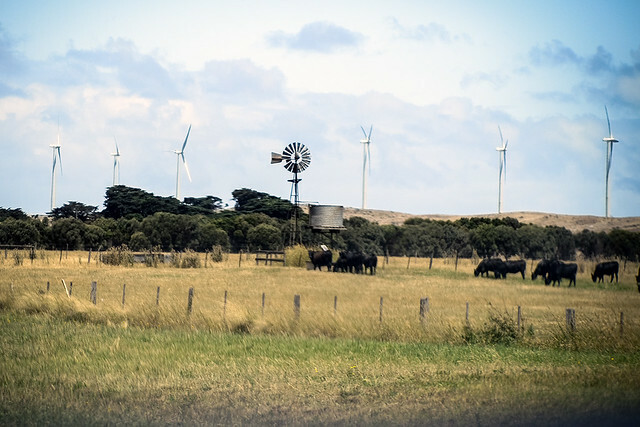 Speaking of windmills, we even drove past some Wind Farms just inside the South Australian border. I know this next shot isn’t the cleanest, but I love it all the same. It tells a great story with no words. If you wanted to get all ‘Art Student’ you could even read into the motion in the foreground as part of telling the story. I’m not an art student though, so I’ll just admit it’s nothing more than a well timed shot out the Santa Fe’s window while doing 110km/h. 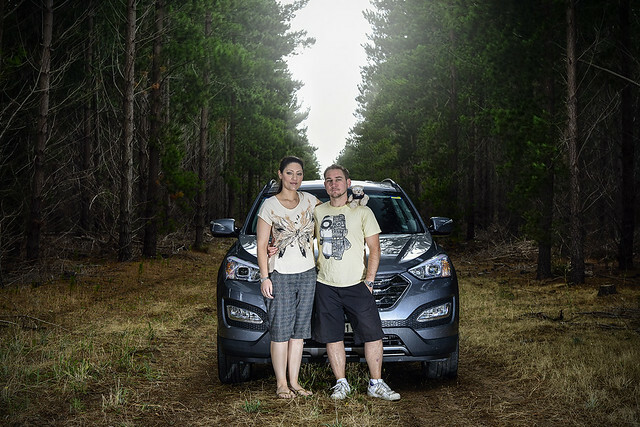 Liv and I paid attention for side roads and tracks leading off the road towards the turbines for a bit of a photo-op. This was as close as we could get without trespassing or knocking on a strangers door.Check out how small those cows are! The turbine would have been the best part of a kilometer away and it’s still towering overhead. 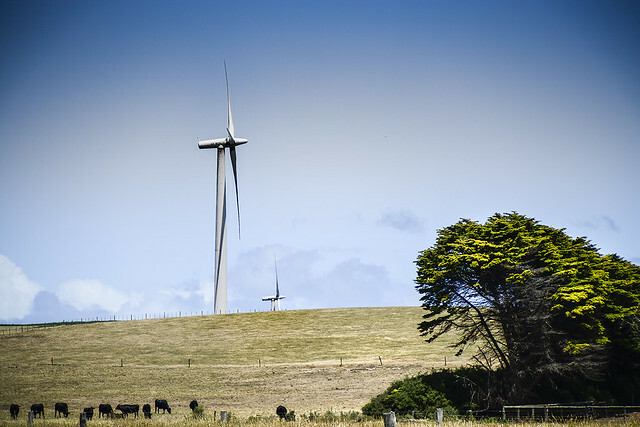 After doing some quick homework, These turbines are over 120m tall! 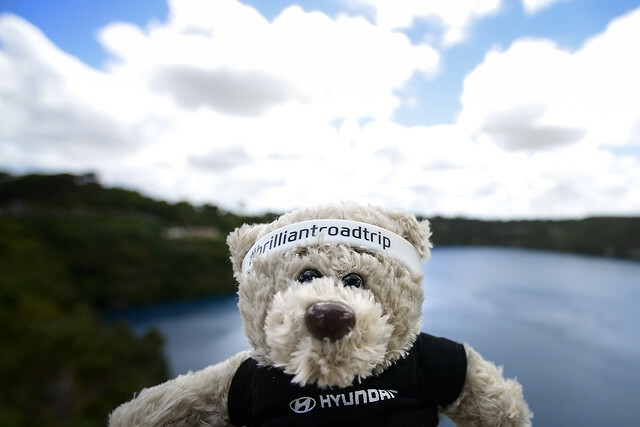 We couldn’t stop long though, we had a few hundred kilometres between us and what would be the highlight of the day, and possibly the entire #BrilliantRoadTrip 😉 Due to our extra exploring we had some time to make up for. 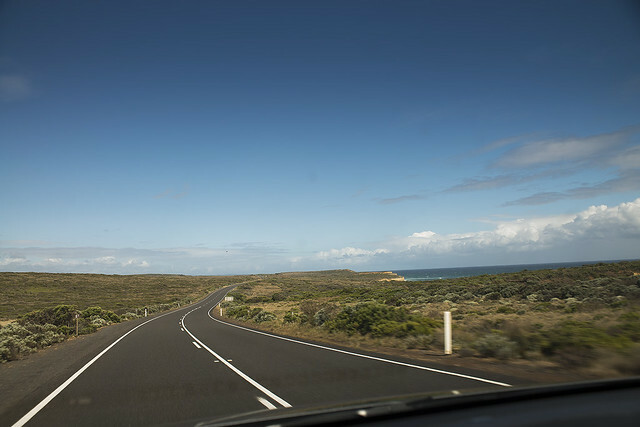 Unfortunately we had to cruise through Port Fairy without stopping and soldier on towards the famous Great Ocean Road. 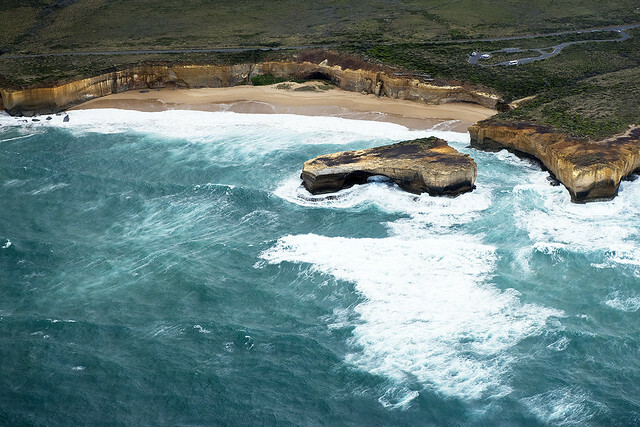 We were booked in for a 4pm helicopter flight over the 12 Apostles and the limestone coastline. Even making our 4pm booking was going to be a massive struggle so we pushed our flight back to 5pm. 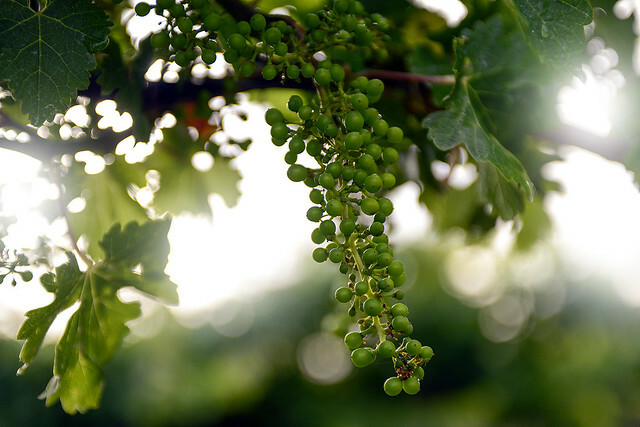 It’s all about the journey and not the destination right? It was so hard to keep to a schedule when driving through some many brilliant places, places that NEED to be explored! 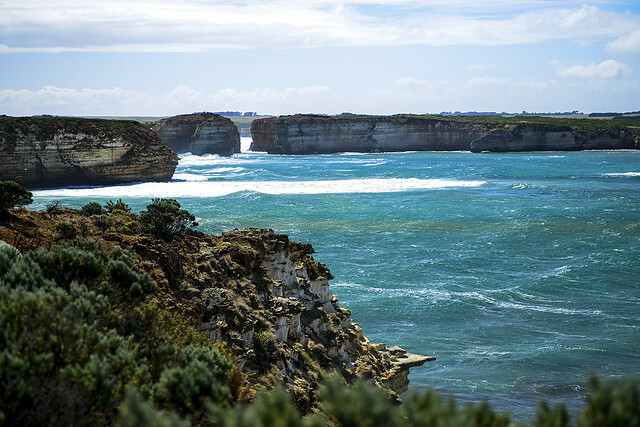 Places like this… THE GREAT OCEAN ROAD!!! 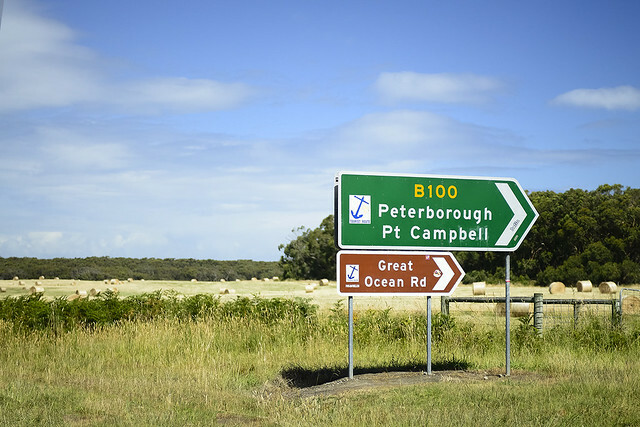 Driving past Port Campbell we could see the water on the Satnav approaching, we were both getting quite excited. 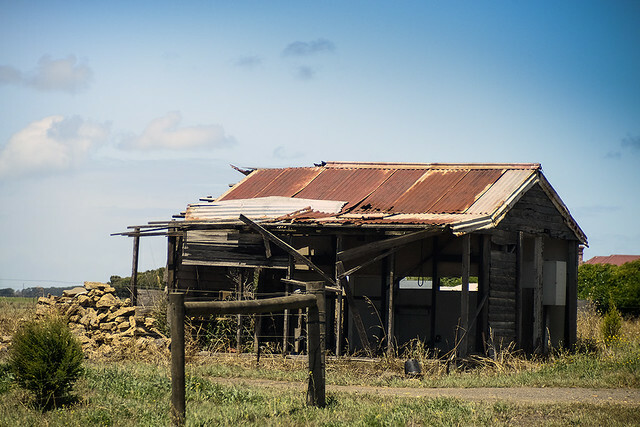 As lovely as the country vistas were a change of scenery would be nice, and if that scenery just happens to be the Great Ocean Road well that’s even better 😀 See the first glimpses of the Ocean to the right? I’m sitting at the airport right now, waiting to head home and I remember it as it happened only seconds ago. 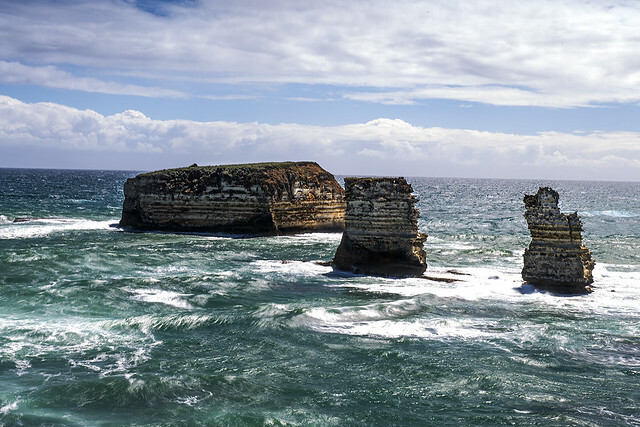 We had just passed through Port Campbell, the road veered sharp right 90 degrees and we saw the first limestone formation poking above the tree line in the distance. It looked like something from an another age, or a video game! We knew were still running a bit behind but we both looked at each and silently nodded. We had to stop for a closer inspection of the Sleeping Giants. 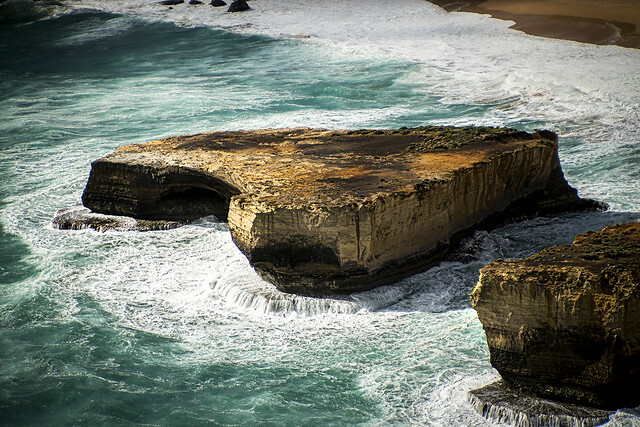 The very last formations along the Great Ocean Road. 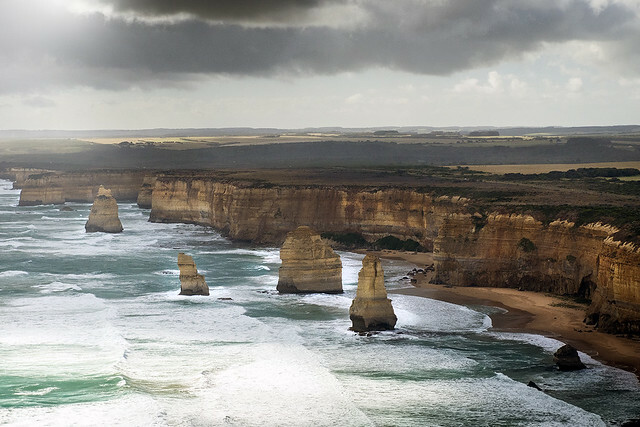 We were told that over 80% of people who come to see the 12 apostles miss these two giants. Hence the name ‘sleeping giants’. 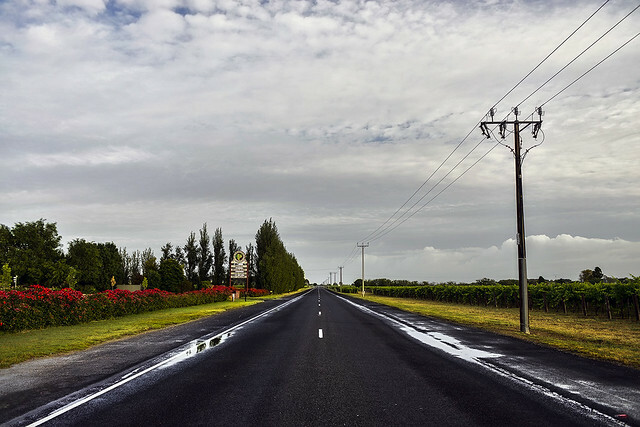 If you head to along the road from Melbourne, make sure you drive on for another 20 minutes. I don’t know if it’s just because they were the first ones we saw but they were definitely the most impressive. 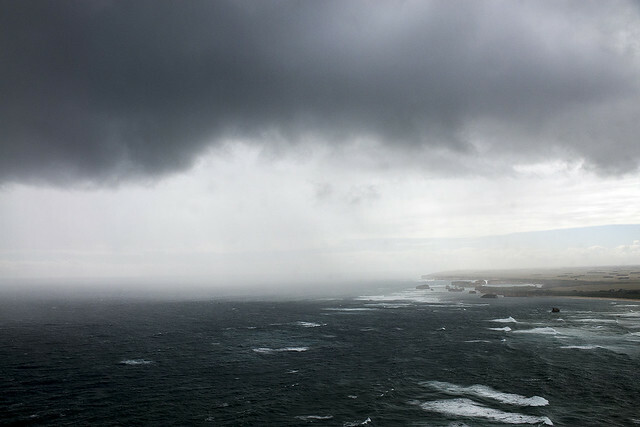 This was our very first view of the coastline…. Impressive? Turning around to face the west was almost as impressive a view too! As much as I could have sat here and just marvelled at the awesomeness on display we had to rush off to our next destination. Hopefully beating those nasty looking clouds that were beginning to roll in from the great south. Luckily the helipad was only a few minutes away and we made our ‘late booking’ just on time. It was time to see the 12 Apostles for the first time, but we were going to see them from a different angle to most, a very high angle! We drove over a crest and could the chopper in a field to the left. There was a lot of excitement in the cabin for just 2 people and Little Bear :p We were close to heading up! 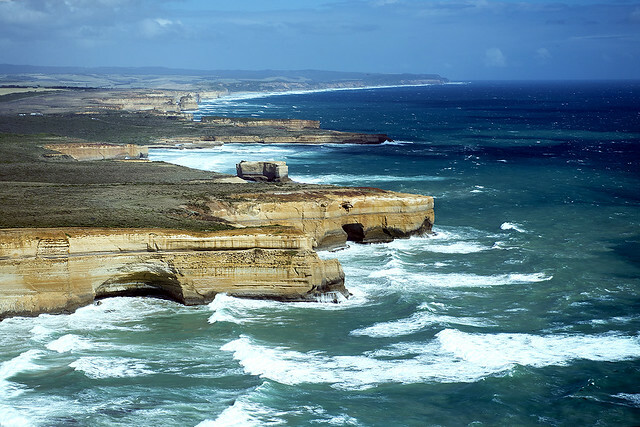 As we headed across do the coast line I looked south and saw the 12 apostles in the distance for the very first time! We headed in the opposite direction, back towards where we had come from and into the same direction as those angry looking clouds we spotted earlier. They’d made their way in and were not sitting just off the shoreline. Dark. Menacing. We pressed on and continued into the dark sky. The temperature inside the chopper dropped dramatically. Suddenly massive blobs of water started pounding the cabin of the chopper. It was a bit of a bumpy ride for a few minutes as the pilot battled the turbulence outside. He wasn’t worried so either were we. We were to excited by the whole thing! Even Liv, who’s known for worrying a bit more than required on occasion had a massive smile on her face! It just made the adventure even more of an adventure and multiplied the almost mythical feeling that this ancient coastline gave off. Check the shot above, see those two tiny formations in the middle, scroll up 4 shots. They’re not so tiny after all 😉 Just like this next tiny rock… London Bridge. Now for a sense of scale… yes, that white dot in the upper right is a big tour bus. Amazing! We made our way to the end of the the Bay of Isles and headed East towards the 12 Apostles and bluer skies. We made our way past other landmark formations like the Seahorse, named for pretty obvious reasons when viewed from above. 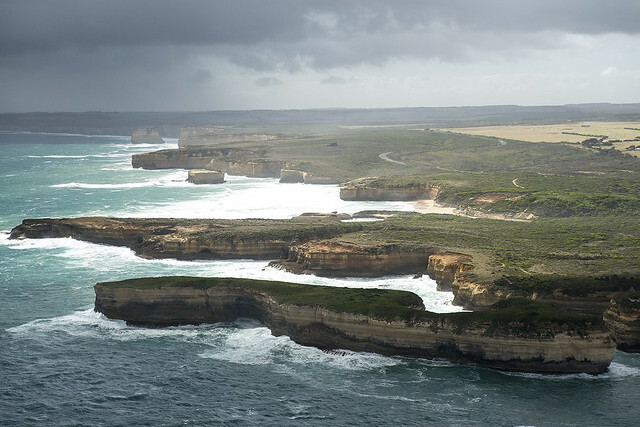 We flew to the eastern most part of the tour, to the beginning of the main line of Limestone formations before turning around again to face west, the view that most Melbournites and tourists would have, except from slightly higher of course. As headed east most of the formations stood alone, isolated. 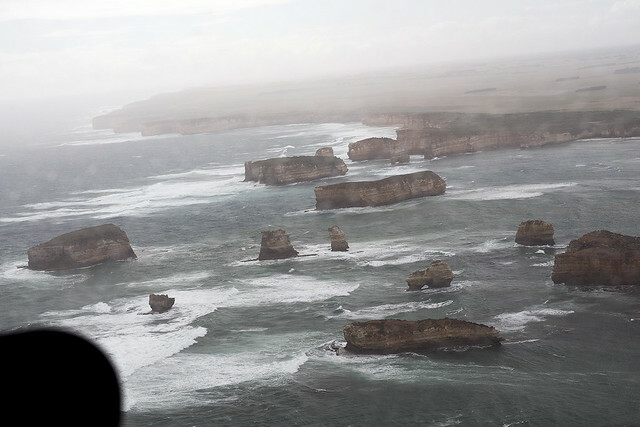 But as we approached the 12 apostles they actually looked like a group of statues. Probably because they’re all lined up nice and evenly. 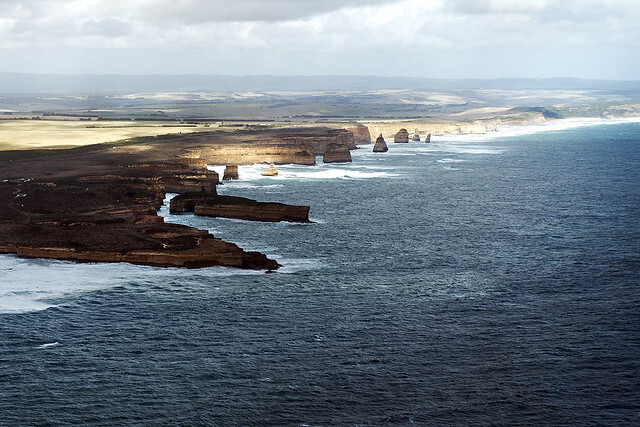 We flew past the Apostles and turned back for a view I had seen before, in magazines, newspapers and on T.V. The whole coastline and all the statues looked like one big chess set from this angle. They didn’t look so alone now. 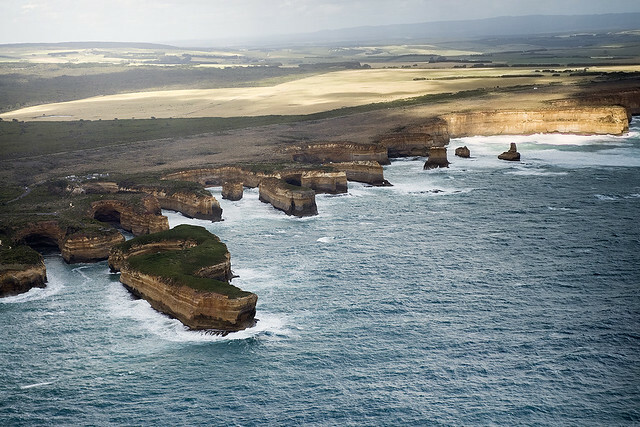 12 Apostles from the air… beyond #Brilliant! 😉 You need to come up and try it out for yourself 🙂 Cue dramatic break in clouds… WOWWWWWWWWWWWWWWWWW!!!!!!!!!! The adventure was over for the day, we headed back to Warrnambool to our hotel for the evening. 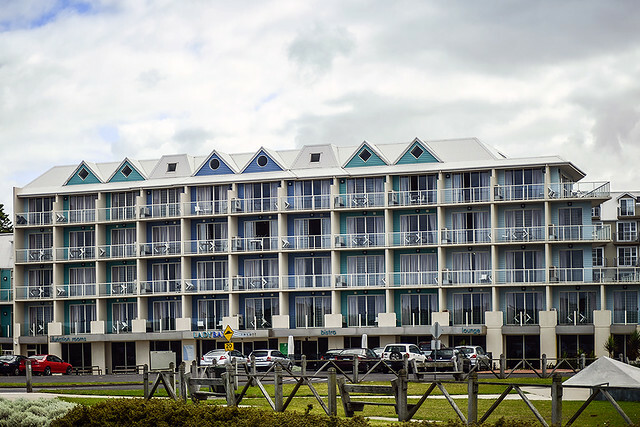 The Lady Bay Hotel. 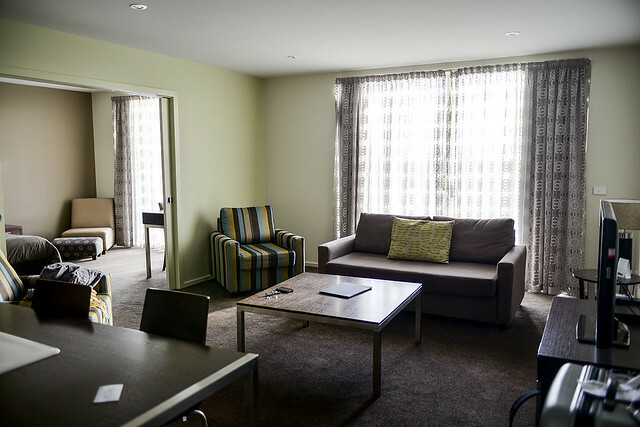 It was more of an apartment than a hotel. After a quick shower and a change of clothes we headed out for a late dinner after very long day on the road and full of adventures. We picked a little Thai restaurant on the main strip, Cattleya Thai, and damn it was the BEST thai that either of us had ever eaten! Every meal was a 10/10! I thought it might have just been because we were hungry, but asked to takeaway what we could finish because it was to good to waste, and it just as good the next day! Shame it’s half the country away! What a day! We crossed states, saw the Blue Lake, explored caves, ran through paddocks, drove from volcanic areas through farmlands to the coast and saw the mighty 12 Apostles from the air all in one day! Today would be in my top 5 days ever! I did plan on writing this post that night, but we didn’t get home til after 10pm and we had another massive day ahead tomorrow. It was time to try and catch some Z’s in preperation for tomorrow. The final day of the trip. 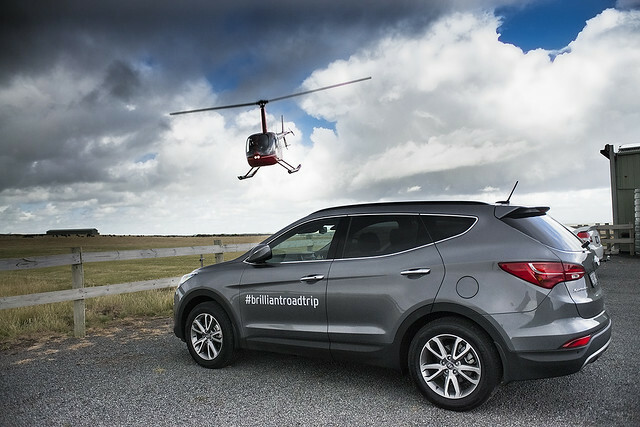 Drive Brilliant – Day One Done and Dusted.